Carbon composite laminates are being characterized for strength properties, damage response and performance for aerostructures. A new generation of aircraft structural composites is to be with optimized designed, incorporated with new technologies, and with improved systems. The structural performance of the parts, in terms of integrity and reliability should be on par or better than the current designs. This research program is focused on establishing the characteristic strengths and reliability of critical design features for the adequate design life of the composite parts and sub-assemblies. An analysis tool for damage assessment and life prediction of the parts is to be developed and integrated into the design and manufacturing process of the new demonstrator. Damage-based predictive models are being developed for assessing reliability of engineering materials and structures. 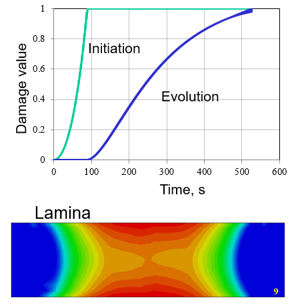 Damage mechanics-based formulations for the constitutive behavior could accurately predict the deformation and failure processes of the material. This research program is focused on the development of the constitutive and damage models for various engineering materials. Strain rate and temperature dependency on the material response are considered. 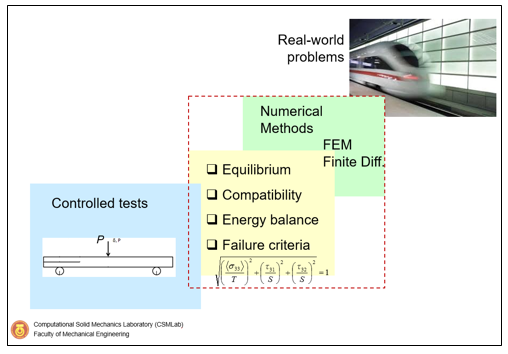 Finite Element (FE) simulation is employed in the predictive methodology. Diverse applications of the resulting framework are being examined, including solder joint reliability, fretting fatigue of steel wire ropes, impact of thin-walled structures and draw-forming of sheet metal parts.